There’s no Delhi guide that doesn’t have a picture of the Lotus Temple stamped on the front page. We’ve got you all the details about what you can do in and around the place so you can make the most of your visit. 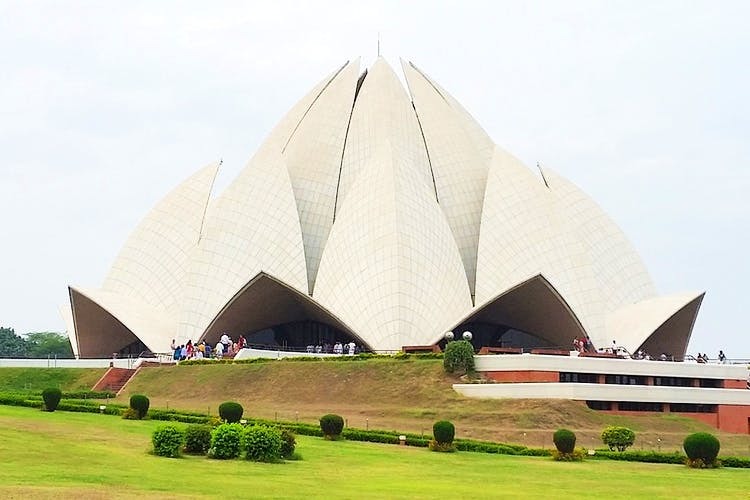 Famous for its splendid architecture, the lotus-shaped marvel made of white marble is easily reachable by metro (the nearest stations being Kalkaji Mandir and Nehru Place). This Baha’i house of worship welcomes you with immaculately manicured gardens, nine ponds and a pathway leading to the huge prayer hall where anyone from any creed is welcome to sit and pray or meditate in silence. (Prayer services are held at 10 am, 12 noon, 3 pm and 5 pm). There’s also a library that you can check out. Don’t miss the picturesque sunset view that this place has to offer. If you’re wondering where to grab a bite post the spiritual visit, head to Nehru Place where you’ll find plenty of eateries at the Epicuria Food Mall. If you still haven’t had enough of the gorgeous temple, we say head for a fancy meal to Royal China inside the Eros Corporate Tower. It’s got a magnificent view of the temple (and we’re not complaining about the lovely, aromatic Chinese food they do, either). We love going to such peaceful places that are a respite from all the city chaos. The place is closed on Mondays, and the entry won’t cost you a dime – although you might have to wait a little in the entry queue.